TO HELP OTHERS SHARE SMILES & JOY. How Do I Become a Tester/Observer for ATD? Would you like to help others experience the satisfaction you feel when you take your dog on a pet therapy visit? If you do, you have an opportunity to take the concept of “Sharing Smiles and Joy” to new heights by becoming Tester/Observer. Our T/O’s must know and follow all of ATD’s rules and regulations and be able to convey them to new and prospective members as well as be capable of communicating effectively and tactfully with people. Who Makes a Good Tester/Observer? ATD has a supplementary medical benefit available to tester/observers and their test dogs, provided the test dog is owned or handled by the T/O and is or was a therapy dog registered with ATD. T/O’s may apply for this benefit only if the T/O and/or the test dog suffers bodily injury from testing or observing applicants, regardless of whether the injury is caused by the dog or the handler being tested/observed. The benefit will cover only medical bills and costs not covered by the T/O’s primary health insurance policy, Medicare or Medicaid and veterinary costs not covered by the test dog’s insurance policy. The T/O and/or test dog is eligible for up to $5,000.00 per incident. Any medical or veterinary costs exceeding $5,000.00 are the sole responsibility of the T/O. The following is the criteria that will qualify the T/O and/or test dog to receive this medical benefit. The T/O must be a member in good standing, current on dues and renewal requirements including having passed the current year’s T/O review. Renewals are due by January 1 or July 1 of each year. If the T/O has not timely paid their dues and an incident occurs after the due date, then the T/O will not be eligible for the benefit. The T/O and test dog must be performing the test or observation at the time of the incident. The T/O cannot be consulting, evaluating, advising or socializing with the team prior to or after testing. The ATD T/O and Test Guidelines must be strictly adhered to during the test or observation. There can be nothing implemented by the T/O that is NOT on the ATD test. Example: The T/O is not eligible for benefits if s/he is hugging the dog, pulling the dog’s tail or stumbling into the handler to evaluate the dog’s reaction. An incident report must be completed with all pertinent details and contact information of witnesses and submitted to the ATD corporate office. The request for payment of this benefit must be accompanied by proof of medical or veterinary expenses outstanding after being submitted to the T/O’s primary insurer. If the T/O has paid any of the medical expenses, veterinary bills or co-pays on their own, then receipts of payment must be included. Notice of a potential request for benefits must be submitted to the ATD corporate office within seven calendar days of the incident and will be investigated and processed by the T/O committee. If the committee approves payment of benefit, the benefit will be paid either directly to the provider or to the T/O if the T/O has included receipts. Injuries sustained by the T/O’s own negligence (such as slipping, falling, or twisting an ankle or a knee). Injuries suffered by the test dog if the test dog is at fault, meaning causing the incident. Lost wages or damage to or loss of property. Pain, suffering or mental anguish. Being a Tester/Observer (T/O) is a privilege granted by the ATD Board of Directors. ATD reserves the right to revoke or not to renew the status of any T/O not complying with the ATD Rules and Regulations and/or these Tester/Observer Guidelines. A T/O must be a member of ATD in good standing for a minimum of 6 months. A T/O must be a minimum of 18 years of age. T/O’s are expected to test and observe all breeds and mixed breeds without prejudice. To maintain active T/O status, each T/O must complete the annual T/O Review. T/O’s are not allowed to charge fees for testing or observing prospective members for ATD. A T/O may not conduct the ATD Test exclusively for a local group or facility. A T/O is required to take and return calls and/or emails from prospective members to arrange for testing. A T/O shall not discriminate against anyone on the basis of race, gender, creed, sexual orientation or national origin by refusing to test any person. A T/O must offer to test prospective teams within 3 months. Ready to be a Tester/Observer? If you’re ready to become a T/O, please contact our headquarters for more information. 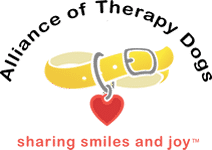 Are you interested in becoming a member of the Alliance of Therapy Dogs? Learn how you and your dog can to join in volunteering with visits to hospitals, special needs centers, schools, nursing homes, and other facilities. If you’re a T/O and you would like to get more involved in helping ATD, then you could serve on our Board of Directors. If you’re interested, please contact our headquarters for an application.